Kevin S. Parikh, Global CEO of Avasant and Chairman of Avasant Foundation was a distinguished honoree of the American India Foundation at their Bowties and Bangles gala event on Saturday 17th March, 2017 at Pasea Hotel & Resort in Huntington Beach, CA. Since the inception of Avasant Foundation in 2011, Kevin and Nita Parikh have contributed over $1.5 million dollars to worthy causes as well as sponsored their own educational and job creation programs for deserving youth across emerging economies. Through Avasant Foundation, nearly 6,000 young adults have been placed in long-term employment throughout Asia, Latin America, and Africa. More striking, over 90 percent of the students in the foundation’s programs are placed in jobs. To this end, the foundation has also been staunch supporters of AIF’s Digital Equalizer program, supporting in 6500 students in 56 public schools in Karnataka and Odhisha which is focused on bringing technology into the classrooms, contributing approximately $100,000 to the American India Foundation. 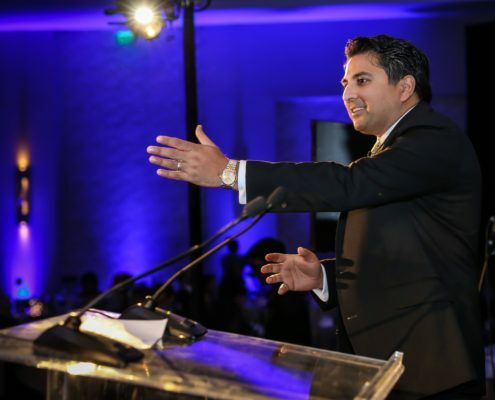 As Founder and Chairman of Avasant Foundation, Parikh recently accepted the Commitment to Action honor from the Clinton Global Initiative for Avasant Foundation’s efforts toward creating jobs for deserving youth in Haiti and Jamaica. Avasant, of which Parikh is Global CEO, is also a member of the United Nations Global Compact, which is focused on the attainment of the UN Sustainable Development Goals. In this journey, Kevin has forged partnerships with several organizations, including the Rockefeller Foundation, the World Bank, and USAID to drive his commitment to youth. Kevin sits on the Advisory boards of both Girl Rising and Womensphere, two organizations dedicated to empowering young women. Nita Parikh, a Partner at Jackson Lewis, sits on the advisory board of the Avasant Foundation and acts as a Board Member on several youth-focused charitable foundations. She is also a recipient of the Most Powerful and Influential Woman Award by the National Diversity Council. Kevin and Nita are dedicated to youth education and have been unwavering partners with the American India Foundation. The American India Foundation is committed to catalyzing social and economic change in India and building a lasting bridge between the United States and India through high-impact interventions in education, livelihoods, public health, and leadership development. Working closely with local communities, AIF partners with NGOs to develop and test innovative solutions and with governments to create and scale sustainable impact. AIF’s programming seeks to achieve gender equity through developing inclusive models that focus on and empower girls and women. Founded in 2001 at the initiative of President Bill Clinton following a suggestion from Indian Prime Minister Vajpayee, AIF has impacted the lives of 3.1 million of India’s poor. With offices in New York and California, eleven chapters across the U.S., and India operations headquartered in New Dehli, AIF is transforming lives across 23 states of India while addressing these issues on a regional, country, and international scale. President Bill Clinton serves as an Honorary Chair and former Ambassador to India, Frank Wisner, chairs the Advisory Council. Avasant is a leading management consulting firm focused on translating the power of technology into realizable business strategies for the world’s largest corporations. Specializing in digital and IT transformation, sourcing advisory, global strategy, and governance services, Avasant prides itself on delivering high-value engagements through industry focused innovation and flexible client based solutions.